https://www.tradingdepot.co.uk/deanta-seville-white-primed-fire-door-1981x762x45mm-wood-white-primed-45sevf-dwhp762 80461 Deanta Seville White Primed Fire Door 1981x762x45mm - Wood: White Primed - 45SEVF/DWHP762 https://www.tradingdepot.co.uk/media/catalog/product/4/5/45sevfdwhp762.jpg 120.99 120.9900 GBP InStock /Building/Doors /Brands/Deanta /Brands/Deanta/Complete Deanta Collection /Brands/Deanta/Seville The 45SEVF/DWHP762 is just a small part of the Deanta door range available at Trading Depot. 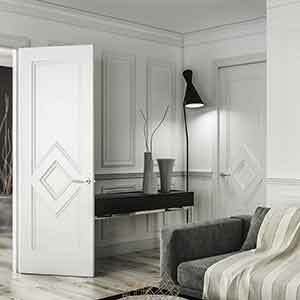 The Seville Interior Prefinished White Fire Door – made by Deanta, is a high quality, stable and beautifully finished door for any home or place of work. Because of its solid timber core, it has a ‘heavy’ feel. Made using smooth faced timber strips on the surface to ensure a smooth, clean finish. They also are supplied with a thick, 15mm solid timber lipping to make them easier to fit and retain screws and hardware much better than other door styles. Also available in Walnut, Oak , Glazed and Fire Door options. Supplied with a 30 minute fire rated core.